Award winning seafood takes a lot of work. The Old Forge North Norfolk is our passion, Fresh Norfolk seafood is a must alongside top quality seafood produce from around the world. This all goes into making our great menu. The old forge Sea Food restaurant is part of the larger Old Forge in Thursford which includes the Bed and Breakfast accommodation, which is perfect if you are looking to explore North Norfolk. We are very proud of our seafood restaurant in Norfolk, our fresh seafood menu captures the best of the local seafood on offer from the Norfolk coastline. We have won the many awards and appeared on television. 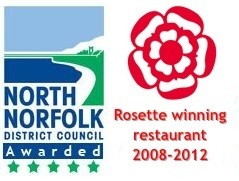 Running a seafood restaurnt in Norfolk is a 24 hour a day job so I do not always has the chance to update the blog. But I promise more news and great recipes from our seafood restaurant very soon.